English oak has held a very special place in the hearts of craftsmen for hundreds of years. Its strength, resistance to decay and sheer versatility has made sure it is engrained in our national heritage. This fine material has been utilised for many hundreds of years to construct everything from sea-going vessels to fine furniture, wine barrels to buildings. 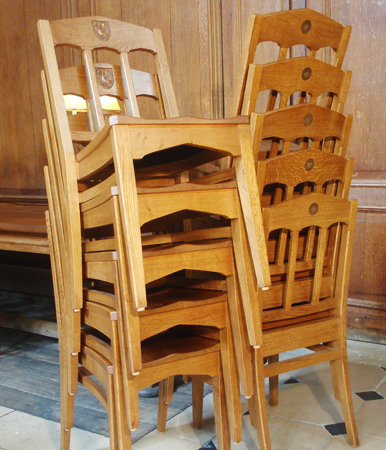 Although oak grows widely across Europe and North America, craftsmen continue to cherish English oak for its beautiful grain and figure which tend to be more decorative and unique than in oak from elsewhere. Even though England does not contain large areas of oak forest compared to, say, France and Germany, there continues to be a healthy supply of oak logs from well-managed private estates. Here at Vastern Timber, we’re dedicated to supporting these woodland owners by processing and marketing English grown oak rather than importing oak from elsewhere. We firmly believe that the only way to protect our remaining forests is to ensure they have a value. ‘Don’t let anyone tell you that English oak is not available. At Vastern Timber have approximately 2000 M3 of English oak plank and planking grade logs in stock’. Wise words there, from our MD, Tom Barnes. We select and store planking grade English oak butts at our Studley sawmill ready for sawing during the winter months. From experience, we know that cutting during these colder and wetter months reduces the chance of surface splitting (checking), a problem caused by rapid drying. We like to store each log for at least a year after felling to allow it time to relax and release tension. In our experience, we find that patience pays off and the reward is flat, straight wood. Once cut, we air-dry the planks according to the time-honoured rule of one year per inch of thickness (27mm). Yes, it’s a slow process, but reassuringly so. Anyone who has had the misfortune of working with a piece of case hardened and brittle imported oak will no doubt appreciate the need for such care and patience. The majority of our oak is produced as waney-edge boards (WE), otherwise known as ‘log sawn’ (LS) or ‘Through and Through’ (T/T). This means that the boards will have the wane or bark attached to one or two edges. Thicknesses from 20mm up to 54mm tend to be cut through the log producing crown, rift and quarter sawn boards. The thicker boards, from 65mm to 150mm, are billet cut resulting in only quarter and rift cut boards. Crown cut boards will show the swirling patterns that result from cutting through the growth rings near their crest. On close inspection, these boards will also include small black flecks (medullary rays) which travel from the heart to the outside of the tree. Quarter sawn boards with medullary rays running parallel to the direction of the cut exhibit beautiful sliver figuring – the result of the rays being sliced longitudinally. 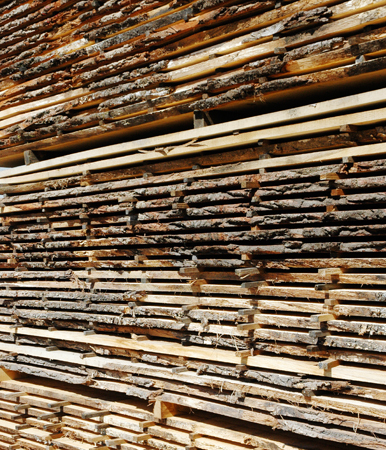 Quarter sawn boards are renowned for their stability although they can suffer from greater shrinkage during drying. During the cutting process we divide the oak into a number of grades according to colour, knot content, and cutting format. We may also separate particularly large or long logs. Our grades are broadly based on the Forestry Commission produced document ‘Making the Grade. 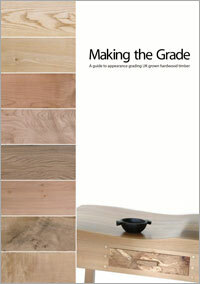 A guide to appearance grading UK grown hardwood timber’. The grades also relate to the French oak grading system. Prime oak is the cream of the crop. The highest quality that we have to offer. The majority of the boards are free of any knots except occasional pin knots. Any isolated defects are measured out. The grain and the colour is reasonably even and consistent. This is our standard joinery and furniture grade. The boards will yield plenty of clear cutting but may include a few pin knots and the odd knots up to 40mm diameter. The grain may be slightly angled and some colour variation is likely. Larger knots and defects are measured out. ‘Character grade’ is a fairly loose term that can describe a wide range qualities. When we are grading our English oak, anything that does not make Prime, First or Pippy falls in to the Character grade. For this reason we are often led by the customer, and grade accordingly. In general, Character grade oak will include unlimited sound defects, knots and surface splits. Curly grain, occasional worm holes and colour variation are also included. Pippy oak is so described because of regular knot clusters or ‘cat’s paws’ across the board. These features are the consequence of sawing through small epicormic growths on the outside of the tree. Boards in this grade will include a distribution of pips, cat’s paws and small burrs across at least two thirds of each board. Occasional larger sound knots up to 80mm may be included. This grade includes the most figured and beautiful pippy oak. It is rare that logs open up and meet this grade but when they do, they are something to behold. The epicormics growths are larger and more regular than in the Pippy grade leaving the boards covered in patches of burr, cat’s paws and swirling grain. In the most extreme cases the burr patches may span the entire width of the board. At least two thirds of each board are covered by either a high density of cat’s paws or individual large patches of burr. Brown oak is not a separate specie or a grade; it is instead the symptom of an attack by the Beefsteak fungus (Fistulina hepatica). The fungus affects standing oak trees by staining the wood a wonderful chocolate brown colour. Within our Brown oak stocks, most boards will be streaky, referred to as ‘Tiger brown’, while the most valuable will be a solid brown colour. In rare cases the boards can be solid brown and pippy at the same time. Try our new search tool to find the best of our sawn plank. To avoid disappointment please make an appointment before arriving at either yard to select sawn timber.